These guys are part of a network that go from store to store buying PSE (pseudoephedrine). In some cases, they are addicts. But in the great state of California “smurfers” are part of organized crime. You wouldn’t believe it by looking at them. But they are. They usually travel in groups hitting every pharmacy, Walgreens, and CVS in the area at a time. They shred the pills/tablets from the blister packs and sell them in bulk to a wholesaler that will furnish them to a methamphetamine lab operator. California was identified as the “Source Nation” for meth in the 1980s. 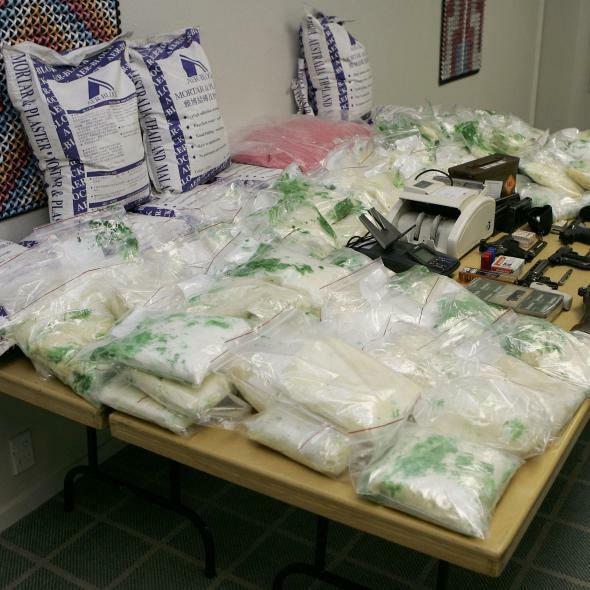 Our state’s illegal production of methamphetamine (meth) had exploded. The previous recipe and chemical precursors changed with the Mexican drug trafficking organizations (DTOs) introduction of the ephedrine and red phosphorus method of manufacturing meth. The results led to the “ice” problems that we have today. This recipe results in a much more potent form of meth and ice than the older Phenal-2-propanon method, commonly referred to as “biker” meth. Huge shipments of ephedrine were imported from China through Mexico into California. The cook cycles were reduced to 36 hours, including bulk packaging. Back then, we (California law enforcement) would snicker when we heard of other states having small toxic labs fueled by pseudo ephedrine, or Sudafed pills gathered by these “smurfers.” We were seizing huge meth labs and large seizures of PSE that was destined for meth production. Our super labs were defined as any lab capable of manufacturing 10 pounds or more in a cook cycle. We were seizing thousands of these yearly even though the DTOs continued to market California-manufactured meth to many other states across the USA. Eventually, the U.S. government worked a deal with Mexico, led by California’s Dianne Feinstein pushing the Combat Meth Act, to put an end of all legal importation of ephedrine into Mexico. Notice that I said “legal.” Because illegal importation has remained a problem. Now, fast forward a few years and law enforcement is dealing with these Smurfers. They purchase the 60 mg blister packs for $15-$35 and sell them for $55-$65 or more. Huge trash sites have been seized throughout the California Central Valley with heaps of hundreds of thousands empty blister packs. These trash sites indicate that the Mexican DTOs were still operating in high gear even though bulk forms of PSE are not available. Low and behold, we discovered that we needed to control the sale of over the counter pseudo-ephedrine. That problem still exists in California with Big Pharma fighting law enforcement over this control effort. Oregon was the first state to put PSE as prescription-only, and the state reduced lab seizures by 90 percent this first year the law enacted. We still don’t have the sales controlled. This drug only got worse when drug producers and users found out how simple it was to convert powdered meth into the smokable Ice. Smoking anything increases the chances of addiction, and we have lost a lot of people to ice. Everyone in California has been touched by the meth/ice problem. Either as a victim of crime or a friend or family member in treatment. I still visit the website Faces of Meth every once in a while, too. If you want to see what ice can do to a user, you need to take a look at it, too. What aspects of law enforcement in the U.S. need the most improvement? What’s it like to be a gang member?